While there are loads of things for executives to do when company business is through for the day, sometimes the temptation to cut out of corporate events early is way too much to suppress. Oftentimes, this means that the magic of Disney takes over and attendees begin to disappear from the required events. This can be avoided by hiring mini coach services to take your attendees to and from the event venue. They’ll pretty much be trapped there until the mini coach transportation shows up at the proper time. Luxury Transportation Group USA understands the mini coach transportation needs of large companies hosting corporate events in Orlando. Those who have visited Orlando for business or pleasure have experienced the crazy drivers and insane traffic jams in the area. This can create problems for executives attending corporate events in Orlando. Being tardy to important meetings should not be an option for executives. 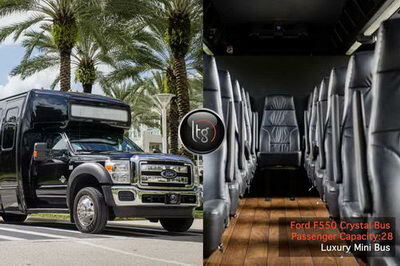 By hiring corporate mini coach transportation services, a company can be assured their attendees will be there on time. The professional drivers at Luxury Transportation Group USA know Orlando traffic and keep abreast of roadway tie ups to ensure the attendees arrive and depart the venues promptly. Luxury Transportation Group USA is the go to corporate mini coach transportation company in Orlando for many out of town national corporations. The staff’s attention to detail paired with the luxury mini coach services make them a valued asset for corporate events. Contact the transportation services experts at Luxury Transportation Group USA to reserve corporate mini coach transportation for your next Orlando corporate event.